The journey of GiGi’s Playhouse Annapolis began with the dedication of area volunteers in 2015, and our doors officially opened on February 3, 2018—making it the 35th GiGi’s Playhouse Down syndrome achievement center across North America and the first in the DC/MD/VA area. Centrally located just off route 50 and near 97, we welcome families from all across the state of Maryland, DC, and Virginia. All of our therapeutic, educational programs and tutoring are free and support all ages, from families with a prenatal diagnosis through adult individuals with Down syndrome. Our programs focus on a variety of skills, including gross and fine motor skills, literacy and math skills, social skills, and confidence–all with the goal of helping individuals with Down syndrome become their best selves. 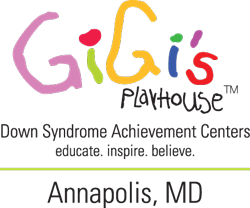 GiGi’s Playhouse Annapolis is committed to partnering with local businesses and organizations to further our overall mission: awareness, education, and celebration of individuals with Down syndrome within the community. If you’re interested in learning more about GiGi’s Annapolis or volunteering or sponsoring programs (which are always free of charge to families! ), please contact us.